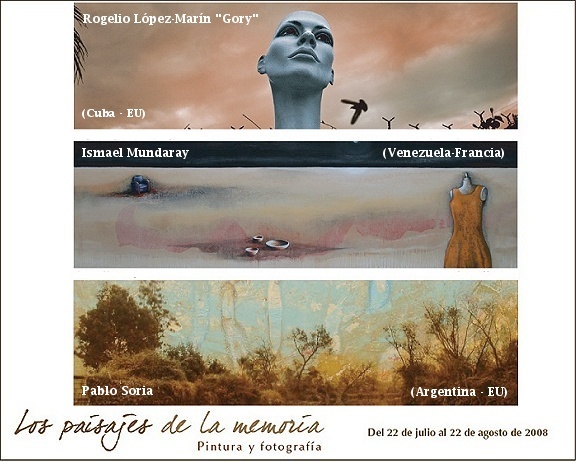 LAllegro Galeria proudly presents the work of three masters of Latin American contemporary painting and photography: Rogelio Lopez-Marin “Gory” ( Cuba – USA ), Ismael Mundaray Suarez ( Venezuela – France ) y Pablo Soria ( Argentina – USA ). Three artists whose works deal with the instant, memory and oblivion; urban or dreamlike landscapes or mementos from the Tucuman jungle. Sites as specific as universal, that no-place that can be anywhere, that can belong to everyone: The Landscapes of Memory. Different paths have taken them away from their homeland. Their roots and experiences, their landscapes and familiar objects; the city as protagonist, the teachers they admire, their dreams and the preservation of the instant, are the central themes of their oeuvre. Looking back it’s a reflection of where you come from, and what you’re made of. Perhaps the immigrant’s uprooting, makes them zealously treasure each memory. Gory (Havana, Cuba, 1954; lives and Works in Miami, Fl), will show works from his two latest series “Nowhere Land”, an homage to Miami, in his own words “the land of all, the land on none, but most important, the land that welcomed us immigrants, and “Because of the City”, a tribute to New York, museum and artist in itself. In the tradition of the photography masters, and with the city as its main character, travesti, urban chameleon, Gory rescues the instant, from anonymity and oblivion, as he discovers the work of art in the urban landscape and in the immediacy of daily life. Quoting Belgica Rodriguez, one of the most respected Venezuelan and Latin American Art Critics, “if one Venezuelan artist is a true titan of painting it is Ismael Mundaray”. Mundaray (Monagas, Venezuela, 1952; lives and works in Paris, France) presents works from his last series “Claire de Lune”. Objects taken from home, whose many identical forms proliferate throughout Mundaray's work show up in the vastness of a dreamlike and nostalgic landscape, like metaphorical links between reality and fantasy, an unbreakable bond with the past. Like Gory, Pablo Soria (San Miguel de Tucumán, Argentina, 1964; lives and works in Miami, Fl) started as a painter, yet memory has always been implicit or explicitly a recurring theme of his. By the end of the nineties, Pablo already considers himself a photographer. For The Landscapes of Memory, we present works from two of his last series “Las Yungas Suite” and “Vanishing”, works that will demonstrate how he does not abandon one means of expression for another. The landscapes of his childhood will be indelibly printed on a Litex camera film tonalized in sepia, over linen and acrylic painting on paper or wood. With works in the most important museums and public and private collections worldwide – the Metropolitan Museum of Art, Fundacion Cisneros, MoMA (NY), Centro Wilfredo Lam (Cuba), Museo Nacional de Bellas Artes (Argentina), LACMA (Los Angeles, CA), Museo de Arte Moderno (Bogotá, Colombia), Museum of Fine Arts (Houston, TX), to name a few, it is an honor to have in our gallery the work of these artists.